The LP-Senator stressed the importance of strengthening political parties through public financing as a suitable way to counter political corruption. "Election finance reform reduces the influence of the moneyed elite and deters the greater evil of drug money invading the political system," Pangilinan said. Referring to the recent military mutiny and the Jose Pidal scandal, the Senator called for an end to the gridlock in the Upper House of Parliament. "The Senate is not the forum for political assassination, intrigue and mudslinging," Pangilinan told the audience. While as a liberal and democrat he values freedom of speech, these freedoms should always be exercised responsibly, the Senator stressed. 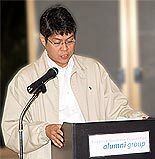 Senator Pangilinan addressed the bi-monthly meeting organized by the FNF Alumni Group. Other speakers, thus far, have been former Senator Jovito Salonga, Ambassador Jean De Kok (European Union), Liberal Party-Congressman and Vice President for Mindanao, Dr. Nereus Acosta and the President of the Liberal Party of the Philippines, Congressman Florencio "Butch" Abad. The full text of Senator Pangilinan's speech is documented in our Liberal Library.